The Toyota Corolla is the bestselling car in the world, with over 1.02 million units sold. 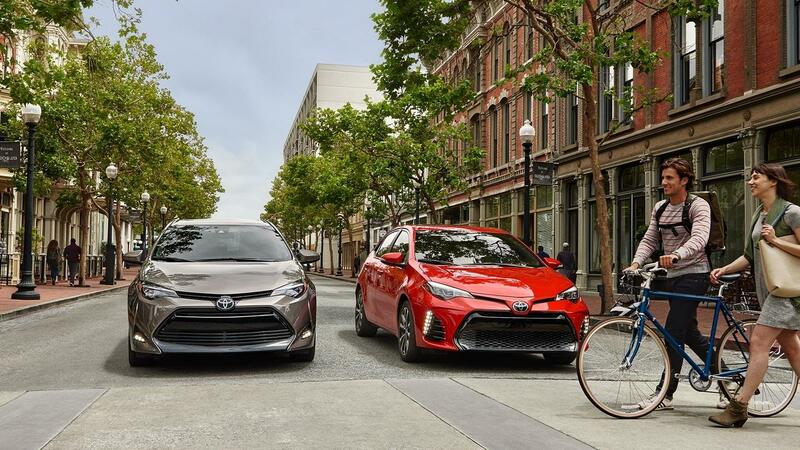 It’s easy to understand the Toyota Corolla’s popularity – no other compact car can match its dependability and craftsmanship. For 2018, the Toyota Corolla adds style and performance to an already reliable platform. Why mess with perfection? The 2018 Toyota Corolla carries over unchanged from the previous model year. Most compact cars are a snooze. It’s like manufacturers are punishing you for needing four doors. Not so with the 2018 Toyota Corolla. The Toyota Corolla refuses to blend in with the rest of the compact car segment. It features an aggressive front grille, as well as Bi-LED headlights. Out back, the Corolla announces its sportiness with a rear spoiler. The body lines are chiseled and aerodynamic. This is not your grandma’s four-door sedan. Inside the Corolla, you’ll find a sculpted dashboard made from premium materials. The focal point of the cockpit is a large touchscreen display, surrounded by piano black accents. The cabin offers plenty of room for five adults and all their cargo. The Toyota Corolla comes in six trim levels: L, LE, LE Eco, SE, XSE and XLE. Standard equipment includes LED headlight and daytime running lights, adaptive cruise control, a touchscreen infotainment system and more. There’s an impressive list of standard safety equipment as well, including a rear-view camera, forward collision warning with automatic emergency braking and pedestrian detection, lane departure warning with steering assist and don’t forget the automatic high beams. The Toyota Corolla comes with such a long list of standard features, what could there be to add on? Glad you asked. Entune premium infotainment system: The Entune infotainment system puts a wide range of entertainment and information apps at your finger tips. Smart Key System with Push Button: The Smart Key system allows you to lock/unlock and start your car with the push of a button. Advanced voice recognition: Ask the Corolla and you shall receive. Want to hear your favorite band? Just say so. Need directions to a Thai restaurant? The Corolla can help you there, too. With the Toyota Corolla, you get both power and efficiency. In most models, the 1.8L four-cylinder engine puts a healthy 132 hp and 128 lb-ft. In the LE Eco, those numbers are bumped up to 140 hp and 126 lb-ft. As for fuel mileage, the Corolla gets up to *28/36 mpg city/highway. Transmission options are either a continuously variable automatic transmission (CVT) or a six-speed manual. All Corollas are front-wheel drive. On the road, the Corolla is responsive and fun to drive. The cabin is quiet and comfortable, making it perfect for your daily commute, or a cross-country adventure. Over a million people can’t be wrong – the Toyota Corolla is an incredible vehicle. Come check out the extensive lineup of Corollas available at Pedersen Toyota. You might just end up taking one home.